Rationality is sometimes identified with responding correctly to reasons. We shall investigate this idea after first considering exactly what a reason is. We shall find that it contains a little truth but not much. Instead rationality is best understood as the source of a number of particular requirements of mental coherence, such as the requirement not to have contradictory beliefs and the requirement to intend means to ends you intend. We shall analyse the notion of ‘requirement’ and examine various particular requirements of rationality. Finally we shall investigate whether rationality is itself reason-giving: if rationality requires something of you, does that fact constitute a reason for you to do as required? Diagnoses of (ir)rationality often arise in the empirical investigation of human reasoning. How can such diagnoses be disputed and assessed? We will articulate a principled classification of different cases relying on a view of experimental work from a philosophy of science perspective. We will then see that much fruitful research done with classical experimental paradigms was triggered by normative concerns and yet fostered insight in properly psychological terms. Cornerstone examples will be discussed, including Wason’s selection task, the conjunction fallacy, so-called pseudodiagnosticity, and more besides. The analysis provided suggests that normative considerations retain a constructive role for the psychology of reasoning — contrary to recent complaints in the literature — but not the one that “normativist” cognitive scientists have often assumed. In particular, the approach I propose does not blur the is-ought distinction. This course covers philosophical theories about rational belief and rational belief change. We discuss theories of rational categorical belief as well as of rational graded belief. We also discuss ideas about the relation between categorical and graded belief. 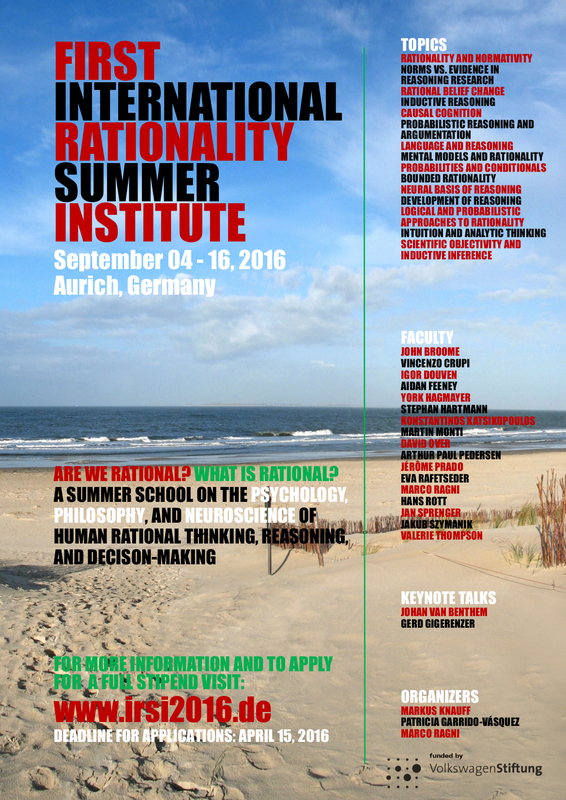 The final part of the course will be devoted to theories of rational belief change. We pay special attention to the contrast between the main Bayesian account of belief change and non-Bayesian alternatives that give weight to explanatory considerations. Connections between the philosophical literature and work in experimental psychology will be emphasized throughout the course. Inductive reasoning is important because it allows us to infer what is likely given what we already know about the world. Focusing on inductive inferences about categories, in this set of lectures I will consider the basic psychological phenomena of inductive reasoning, ongoing debates about how the ability to make inductive inferences develops, descriptive and more recent process-level theories of induction, and what we understand about relations between induction and other forms of inference. Causal reasoning is a central cognitive competence. It is involved in making diagnosis, explaining events, selecting causes, predicting the future, learning about causal structure, and deciding on action. In this course we will explore the various types of causal reasoning and respective theoretical models. These models come from philosophy, psychology, and the cognitive sciences. We will start with causal Bayes nets, the currently predominant normative model. We will then turn to descriptive, psychological models and look at causal model theory and cue-based models of causal induction. These models focus on reasoning about generic causal relations. Next we will investigate models that address reasoning about single cases and learn about mechanistic, counterfactual and narrative- based accounts. We will end by discussing limitations of these models and ideas about an integrative account. Probability theory is an excellent tool to study reasoning and argumentation strategies in scientific and non-scientific contexts. Part I of this course gives a systematic introduction to probability theory, the theory of Bayesian networks, and Bayesianism. In Part II, we will focus on a number of examples which are analyzed in detail. More specifically, we focus on the so-called no-alternatives argument, analogue simulation, and inference to the best explanation. We also show how learning conditional information can be modeled and sketch a fully Bayesian theory of argumentation. Bounded rationality does not speak with one voice. This course will present two cultures of bounded rationality, which I call idealistic and pragmatic. The idealistic culture modifies the ideal of neoclassical economics by incorporating psychological variables in the optimization calculus; the pragmatic culture proposed that people may ignore information and seek to satisfice, that is, reach an aspiration level. The cultures are illustrated by models and data from choice under risk, bargaining games, and behaviorally informed policy. Evidence on the prescriptive power of bounded rationality is also discussed. The goal of the course is to acknowledge different points of view on bounded rationality and identify what they can learn from each other. In this course we will address the long-debated issue of whether language pays a role in shaping aspects of human cognition, such as mathematics, logic, and music, among others. More specifically, we will address the question of whether the syntactic mechanisms of natural language form a basis, or a scaffolding, for other aspects of structure-dependent cognition to emerge. We will first overview the theoretical backdrop of the discussion, including the Universalism claim that language is just a conduit for thought, but plays no role in shaping it, as well as the extreme opposite view of linguistic relativism, often referred to as the Sapir-Whorf Hypothesis, according to which language forms a basis and an organizational principle for human cognition. Following this introduction we will focus on the evidence from behavioral and neuroscience studies (including healthy volunteers and patient data) that bears on the point. The main topics we will cover include number cognition, deductive reasoning, and music cognition although, if time permits we will extend into further domains such as spatial cognition and theory of mind. In addition, in the early part of the course, we will spend some time understanding the importance of experimental design in the context of neuroscience studies, and particularly neuroimaging, in order to allow students to develop the necessary skills to properly assess the evidence that will be discussed. Conditionals – indicative, counterfactual, deontic, and others – are central to the study of reasoning in logic, philosophy, and psychology. New Bayesian and probabilistic approaches to the study of cognition have recently had a major impact in the psychology of reasoning generally and the psychology of conditional reasoning in particular. These lectures will introduce the new psychological accounts of conditionals and conditional reasoning, and explain their relation to logical and philosophical theories of conditionals, including the fundamental claim that the natural language indicative conditional is best understood as a probability conditional, with a probability equal to the conditional probability, P(if p then q) = P(q|p). This course will explore the brain mechanisms that support human reasoning. It will feature a survey of the techniques used to study the neural basis of reasoning, as well as an in-depth review of the neuroimaging and neuropsychological studies to date. Major topics will include whether there are dedicated reasoning modules in the brain, whether deductive and inductive reasoning rely on similar mechanisms, what regions support the development of reasoning in children, and whether there is evidence for different reasoning brain systems. We will also discuss current views and controversies in the field, and see how neuroscience findings may provide important insights for cognitive theories. The course will particularly focus on the development of counterfactual reasoning and how this may impact on our understanding of other people’s perspectives. Over the past 30 years developmental psychologists have sought to get a deeper understanding of the cognitive underpinnings of counterfactual thoughts by investigating the progress that children make in their understanding of counterfactuality throughout their development. The course will (a) outline key developmental stages, (b) highlight discrepancies in developmental studies, (c) discuss neuro-scientific evidence and (d) draw connections between counterfactual reasoning and theory of mind (mental causation). The ability to gain new insights from given knowledge by reasoning is one of the most fundamental cognitive abilities of humans. Psychological findings show a difference between inferences drawn by humans and by formal reasoning systems implementing classical logic. These differences can be found for all domains: in reasoning about relations, in reasoning about conditional statements, and in reasoning about syllogisms. In this course I will first introduce several examples for each domain demonstrating specific effects in reasoning, including content effects and illusions. In a second step the theory of mental models is presented and applied to the different effects. In a third step the theory is evaluated and differences to other theories and alternative approaches are discussed. The course first introduces various formal models of plain belief, comparative strength of belief and degrees of belief. After that, various strategies for belief change are presented, beginning with changes of plain belief in the classical AGM tradition that are based on various sorts of selection mechanism. Then I consider belief change in the context of imperfect discrimination and iterated as well as relational (“two-dimensional”) belief change. Building on a short overview over ranking functions (in the sense of Spohn) and probabilistic acceptance rules, we look at the connection between numerical approaches to belief revision and qualitative approaches. All models discussed are characterized by rationality constraints. The authority of science relies, to a large part, on an image of objectivity in the sense of being free of bias and personal values. Objectivity is also often named as a criterion for judging the rationality of a scientific inference. This course introduces the students to different philosophical understandings of scientific objectivity and applies them to problems in inductive inference, such as: Can we give an objective assessment of the strength of a confirmatory relationship? In which sense are statistical inferences based on subjective degrees of belief (=Bayesian inference) still objective? What are rational strategies for increasing objectivity and minimizing bias in reporting and publishing research findings? The course mainly operates on the conceptual level and does not presuppose knowledge of mathematics. Some affinity to (not familiarity with) reasoning with probabilities is helpful, though. Reasoning is one of the key aspects of human cognition. Traditionally logic was meant as a systematic theory of human reasoning, but in the 20th century the main developments in logic focused on mathematics and its foundations, and logic has been gradually replaced by more specific cognitive theories of reasoning. Still, these theories are mostly inspired by classical consideration of logic, probability, and computations. In this course we are going to overview and compare the main proposals for theories of reasoning known from the literature: mental models theory, mental logic, and Bayesian rationality; contrast them with various purely logical approaches; and finally look into the future, where logic, probability, computations, and cognitive science meet to account for human reasoning. In this course we will discuss metacognition and the role that metacognitive processes play in monitoring and controlling reasoning and decision-making. We will focus primarily on the interface between intuitive and analytic thinking, with the goal of developing a framework to explain why, under some circumstances, a given individual gives an intuitive answer, and why, in other circumstances, she thinks more carefully. To answer these questions, we must, of course, think carefully about what we mean by “intuition” and “analysis” and how we can separate them experimentally.